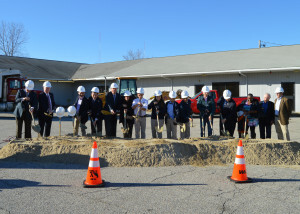 Cumberland, RI – Yesterday Blackstone Valley Prep Mayoral Academy and Civic Builders held a groundbreaking ceremony to celebrate the launch of construction of BVP High School. The school is projected to be ready for the 2017-18 school year. 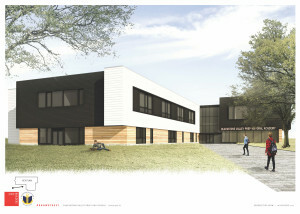 It will be home to 320 scholars, grades 9-12. Ceremony attendees included Lt. Governor Daniel McKee, Mayor James Diossa of Central Falls, Mayor William Murray of Cumberland, and Town Administrator T. Joseph Almond of Lincoln. The facility will be approximately 40,000 square feet and will include: 10 core classrooms, 2 science classrooms, art room, makerspace, music room, cafeteria, media center, gymnasium, administrative support spaces, field space to accommodate soccer, and requisite parking. The projected construction budget is $10.3 Million. BVP will lease the building from Civic Builders with a purchase option after the first few years. 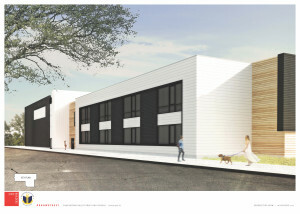 The exterior design, approved by the Cumberland Planning Board earlier this year, is inspired by the surrounding neighborhood and green space as well as the role of the Blackstone Valley in the early days of the textile industry. 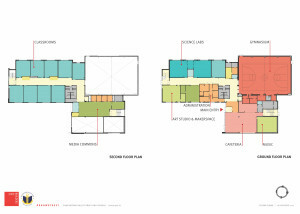 Given this, the use of cedar planks and corrugated metal on the exterior of the building are to reflect a contemporary use of industrial materials. 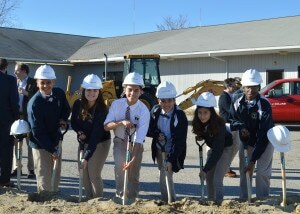 To read the article on our groundbreaking featured in the Pawtucket Times, click here. For the feature in the Providence Journal, click here. Blackstone Valley Prep (BVP) is a network of tuition-free public schools chartered by the Rhode Island Department of Education. As a growing network of schools, BVP offers a high quality public school choice to the families of Lincoln, Cumberland, Central Falls, and Pawtucket and currently serves almost 1,600 scholars in grades K-11 at 6 schools. A member of the Rhode Island Mayoral Academies network, BVP’s mission is to prepare every scholar for college and the world beyond. More information can be found at blackstonevalleyprep.org. Civic Builders transforms children’s lives and revitalizes communities by building inspirational schools for students in underserved neighborhoods. Dedicated to giving every child the chance to attend a great school, Civic Builders partners with the nation’s best educators to create public charter school buildings in communities where the need is greatest. Civic Builders marries real estate know-how and financial expertise to develop great schools so children can build their futures. Every classroom created is a space where children learn and thrive for generations to come. 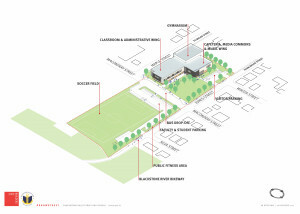 More information can be found at civicbuilders.org.